﻿ APC VS UPC, which one to choose? When talking about passive products, like patch cord, pigtail, adapter and splitter, will involve UPC and APC description. Some people may be curious. For example, what is LC/UPC - LC/UPC? What is SC/APC - SC/APC? In fact, UPC and APC are two grinding methods for optical fiber bushings. Today we will mainly introduce these two different grinding methods for you to choose the right solution for the network center. Install connectors on one fiber end face, return loss is unavoidable, this is due to the reflection of the optical source. Serious optical loss will damage the laser optical source and interrupts the transmission of signals. Therefore, connector rings with different grinding methods can avoid severe echo loss to a certain extent. 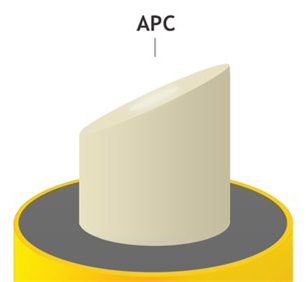 UPC and APC are two widely used grinding types. UPC, ultra physical contact, evolved from PC and has better surface finish. 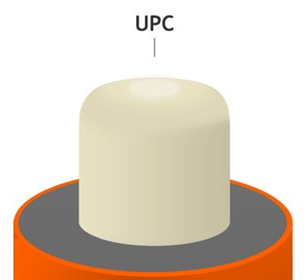 UPC connector depends on machine polishing, low return loss. APC, angular physical contact. The end face is drawn to a 8 degree angle, which is beveled to reduce reflection. APC can only be connected to APC. Since the structure of the APC is completely different from the UPC, if the two connectors are connected with a flange, the optical fiber end of the connector will be damaged. How to distinguish UPC and APC? Different end face. The UPC connector is polished without angles, but the APC connector has an angle of 8 degrees. Optical reflection mode. The UPC connector will reflect any reflected light back into the light source in use, but the APC connector reflects the reflected light at a certain angle to the cladding rather than directly to the light source. Return loss. The APC connector provides -65 dB return loss, the UPC is -50 dB. If the return loss is low, the connector can achieve better matching performance. Connector color. The UPC connector is usually blue, while the APC connector is usually green. When choosing an optical patch cord, it should be based on your actual application. APC connector performance is better than UPC. APC is best suited for high bandwidth applications and long distance links. Such as FTTx, passive optical network(PON) and Wavelength division multiplex(WDM) are more sensitive to return loss. Therefore, the APC is a better solution for providing the lowest return loss. However, extensive use of APC connectors will increase costs considerably. If the return loss requirement is not high, the UPC is a better choice.